Upon the islands of Komodo in the farthest reaches of Asia lives a mighty beast known as the Dragon of Komodo. A relative of the dragon, the largest are said to reach lengths of ten feet or more, and weigh more than a fully-grown man. His scaly belly drags across the ground as he walks, and tongues of flame lick from his mouth as he searches for prey. His head is like that of a dog, but hairless and noseless. At first glance, the Dragon of Komodo seems to have no teeth, only gums, but the teeth are hidden from sight underneath the gums, to lull the unsuspecting into a false sense of security. The Dragon of Komodo’s teeth are long and serrated, and carry a deadly poison. Even if his prey escapes, having suffered the Dragon’s bite, his victory will be short lived. Within hours, the poison of the Dragon of Komodo will take effect, and the prey will suffer illness until he is deceased. The Dragon of Komodo has a preternatural aptitude for finding carrion, and he will travel miles to find his escaped prey after it has expired. The Dragon prefers to find dead carrion to the tiring process of hunting out prey himself, but this does not make him any less capable of indiscriminate murder. He is a deadly creature who has truly earned his title as a Dragon, with sharp claws that can slice through hide, meat, and bone, and armored scales that can turn aside the heaviest of blows. Sadly, leather made from the hide of a Dragon of Komodo does not function as functional armor, though it is as hard as steel when worn by the Dragon. With his poisonous bite, his sundering claws, and his armored skin, it is no surprise that the Dragon of Komodo is the greatest predator on the island that is named after him. No animal on this island is safe from his hunger. He will eat anything he can sink his teeth into; livestock, birds, man, and even Dragons smaller than he is. The hunger of the Dragon is endless, and he will travel many miles a day in search of food. All creatures flee when the Dragon approaches, but the mighty predator can pursue his prey in short bursts of great speed, before tearing his prey limb from limb with terrible claws. The Dragon has shown the ability to open his mouth wide enough that he might swallow whole animals as large as a goat. After filling his stomach, the Dragon drags himself into the sunlight to sleep, and after several hours, will regurgitate a sticky pellet made of the parts of his meal that were indigestible. Despite his many natural weapons making him an ideal hunter, the Dragon prefers others to do his work for him. The main staple of the Dragon’s diet is carrion, and the beast has shown a preference for the meat of Christians. When given the option, he will always choose to consume the bodies of the faithful before all other types of meat. Astoundingly, he finds the flesh of heathens to be revolting to taste, and he would rather starve then consume the body of a Jew or a Muslim. After consuming a Christian, the Dragon of Komodo has been seen to regurgitate the Christian’s immortal soul as part of his disgusting pellet, and many have reported seeing the Devil himself come to claim the Christian’s soul and reward the Dragon for his service. The Dragon has a keen sense of smell, being able to find carrion that is miles away; however, his sense of hearing is incredibly weak, leaving him unable to hear even the loudest of screams. In particular, he has no visible reaction to the name of the Lord, or Christ, or any of the saints or any passage of scripture. This is likely a boon from his master, the Devil. The Dragon cannot be deterred from hunting his favored prey, Christians, even when he (the Christian) invokes holy words to protect himself. Were the Dragon able to hear the words of his Christian prey, he would likely be turned back by such a show of faith, as all animals do when a devout Christian yells out “CEASE, FOUL CREATURE, IN THE NAME OF THE LORD OUR GOD, LONG MAY HE REIGN IN HEAVEN” at the top of his lungs. When Dragons hunt in packs, it is the largest of Dragons that eats his fill first. The smaller wait until their leader has filled his stomach on carrion before they begin to eat, showing a strict hierarchy with the strongest Dragon at the top. However, if there are any arguments regarding the pecking order, they are addressed not through diplomacy, but through single combat between the two opposing parties. The Dragons fight fiercely, tearing through scaly armor with tooth and claw, ripping at throats and stomachs, while sharp tongues of flame flicker from their mouths. When the battle is over, the loser must obey the victor, usually by allowing him to eat his fill first. This is only in cases where the loser is still alive afterwards. In many of these arguments, the outcomes are fatal, and the victor is the Dragon who remains among the living while his foe bleeds in the dirt at his feet. Frequently, the victorious Dragon consumes the corpse of the defeated, a horrible cannibalistic act that is his final declaration of total victory over the weak. The Dragon thrives in hot and dry places, indicating a choleric disposition. The Dragon’s connection to fire can be seen in the tongue of flame that sticks out of his mouth, though the Dragon of Komodo cannot release great infernos from his jaws like true dragons. Further evidence that the Dragon of Komodo is a choleric beast can be found in the fact that he mates in the hot and dry months of the summer, the season most closely connected to the choleric humour. After the mating has been finished, the female Dragon digs a hole and lays her seeds in the dirt. Months later, in the end of the months of spring while the air is thick with insects, a number of Dragon hatchlings will burst from the ground. These hatchling Dragons will spend their youth in the branches of trees, to escape the predations of elder Dragons who have no scruples about eating the flesh of their own young. In many ways, the Devil is extremely similar to the Dragon of Komodo. When hunting, the Devil, like the Dragon, lies in wait for his prey, and hides his true nature behind a harmless façade, appearing to his prey as a harmless friend. When his prey, the innocent Christian, is within his reach, unsuspecting of the Devil’s true nature and most susceptible to his corrupting charms, he strikes, claiming the soul of the Christian and carrying it down to Hell to nourish his unholy palate for all eternity. Even those who escape the clutches of the Devil’s sinful ways are not truly safe. The allure of hedonism is a constant companion to he who has escaped its clutches, and one day will prove to be too strong to be resisted. The innocent will succumb to the poison of the Devil still flowing in his veins, and the Devil will have his prize. The Devil delights in deviously deceiving the downtrodden, drawing them deeper down into disgusting derelictions of duty, dooming them to dark depravity and damnation. Only through a life of worship and penance can a Christian who has been tainted by the Devil’s poisonous hedonism find forgiveness and salvation, and only then can he truly escape the Devil’s clutches. Furthermore, the Dragon and the Devil share the same talents at seeking out the vulnerable, the easiest prey for both creatures, and both breathe tongues of flame that do not burn their flesh. Beware the Dragon of Komodo, for he is the ally of the Devil! As I have said previously, the Dragon of Komodo is the favored monster of the Devil, but recent discoveries have shown that this may not be the case. In the past, some female Dragons in captivity have conceived hatchlings, despite never having come into contact with a male Dragon. The eggs that survived long enough to hatch produced sons, born untainted by the Original Sin in the same way as our Lord and Savior, Jesus Christ. But why? Why has God given the Dragons of Komodo a shepherd to lead them from sin? Has He deemed these creatures as worthy of salvation as Man, His favored creation? Do these pure Dragon hatchlings truly share the same blood as Christ? Is the Lord our God the father of a lizard? Does the Lord see the Dragon of Komodo as equal to Man? Is He trying to steal one of the servants of the Devil from him? What does it all mean? Are the Dragons of Komodo somehow superior to us, with their armored skin and their sharp claws and their gluttonous, slothful, rage-filled lifestyles? Why has God forsaken us in favor of a creature that has shown a preference for the taste of His children? Is this an omen of things to come? Truly, we must work to regain the favor of the Lord, and reclaim our rightful place as His favored creation. Besides, the Dragon of Komodo would not find any solace in Heaven, and would much prefer the climate of Hell, where he, by all rights, truly belongs. Author’s Notes: Something a bit different this time. This is an essay I wrote for a medieval literature class I’m in. We’ve been reading old medieval bestiaries recently, so our assignment was to take an animal and write a bestiary entry about it, using modern knowledge about the animal. See, medieval bestiaries weren’t what would be considered ‘scientifically accurate’. Many of the entries we read not only contained information about animals, they also had moral lessons, most frequently by comparing the animal to some Christian figure (usually Jesus). There was also a lot of information that was by no means accurate at all. For instance, the strange case of the goose barnacle. 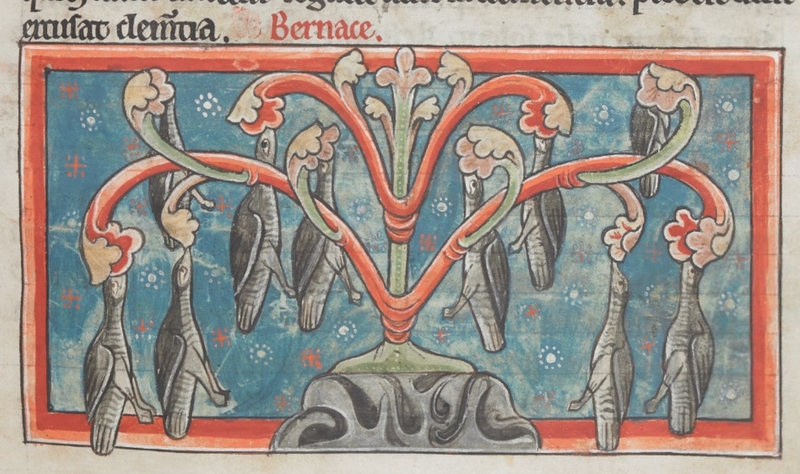 Medieval bestiaries actually believed that goose barnacles were the ‘eggs’ of barnacle geese. Which meant that geese were considered vegetables. As an added bonus, the bestiaries contained very bad drawings. Most pictures of snakes had wings and/or legs, a lot of animals looked like they had dog heads, etc. I like to think of the middle ages as ‘Europe’s deviantART stage’. So that’s the story behind this. I took modern knowledge of the Komodo Dragon and spun it to sound like it was written in a medieval bestiary. It was fun to write.